This morning the sun isn't even up yet, but there are birds chirping. It is a sound that I never tire of and reminds me that even though I was in wool a few days ago, spring is just around the corner. 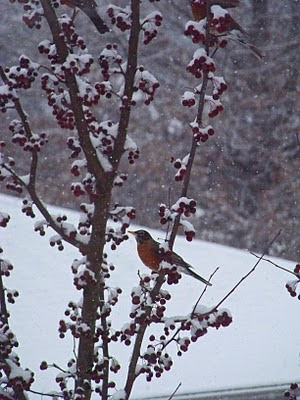 Two weeks ago we had a flock of robins in our yard. I had no idea robin's flocked, but apparently they do. I informed them that (at the time) there was still snow on the ground and that perhaps they should come back in a couple of months. They ignored me and continued picking the berries off of our ornamental crab apple tree. 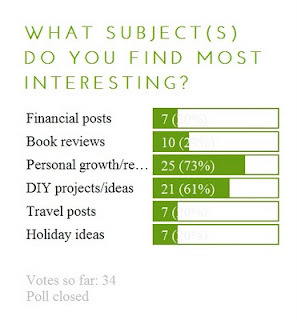 A BIG THANKS to all of you who took the time to vote on the poll last month. I have to admit that the results surprised me a bit (#1: Personal growth/religious, #2: DIY projects/ideas, #3: Book reviews), but they also gave me some idea of what you want to see and what I should nix, so that was helpful!